Tooth resorption is a relatively common and painful condition in cats. It can be seen in dogs as well, although not as frequently. These lesions used to be referred to as “neck lesions” due to their common location at the “neck” of the tooth where the gingiva meets the crown. They have also been called FORLs (feline odontoclastic resorptive lesions) or feline caries, but this is a misnomer because there have been no reports of cavities in cats. In tooth resorption, odontoclasts, cells that are normally present around the root of a tooth, get activated (for unknown reasons) and begin “eating away” at the tooth substance. This process will continue and eventually affect all parts of the tooth including the crown, dentin, and root canal. This causes inflammation and pain when the lesion is exposed to the oral cavity. 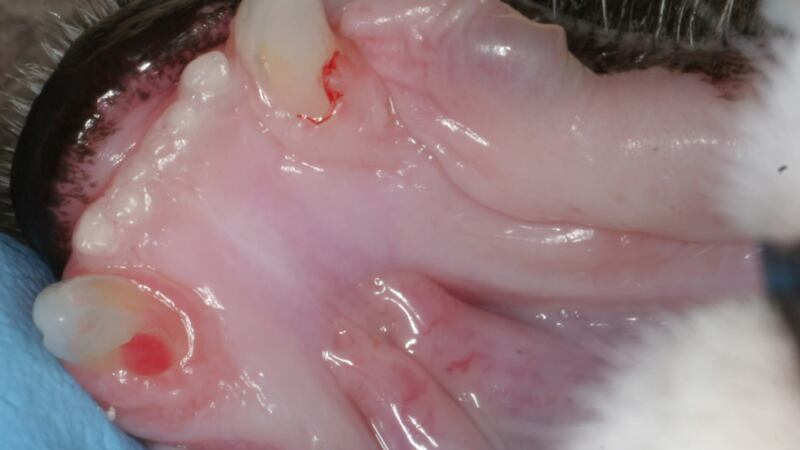 We do not know what causes tooth resorption at this time and to date, no studies have been able to elucidate the etiology of this disease in cats. We have seen evidence of tooth resorption in skulls dating back to the 13th century, so it is certainly not a new disease, but it appears that there has been a sharp increase in prevalence over time. Cats are extremely tolerant of pain and will rarely show obvious signs of oral discomfort unless it is extreme. Because of this, tooth resorption is most commonly diagnosed incidentally on general examination. The mandibular third premolar is the most commonly affected tooth and should be monitored closely on awake examination when possible. If this tooth is missing or affected by resorption, full-mouth x-rays and oral examination should be performed as it is likely that other teeth will be affected as well. Other signs of resorption on awake examination include a visible hole in the tooth and/or inflamed gingiva “growing up” over the surface of the crown. This picture shows an area of inflamed gingiva “growing” over the back edge of the mandibular (lower) 3rd premolar tooth. This was found to be a resorptive lesion. This is the x-ray of the lesion shown in the picture. You can see that the distal (back) root has lost a normal appearance and now looks like the surrounding bone, where the mesial (front) root is still intact. This would be a type 3 lesion and the mesial root would be fully extracted while only the remaining root substance would be removed for the distal root. On anesthetized oral examination, tooth resorption is confirmed with the use of a dental explorer instrument and dental x-rays. X-rays are imperative for two reasons: 1- they reveal more lesions than oral examination alone and 2- they determine what the treatment will be. Lesions are classified as either type 1, 2 or 3 based on the progression of the disease. Type 1 lesions (often associated with periodontal inflammation) involve variable amounts of loss of the tooth structure, but the root and periodontal ligament remain intact. Type 2 lesions involve loss of normal root structure and the root structure takes on the radiographic appearance of alveolar bone. Multi-rooted teeth can display signs of both type 1 and 2 lesions and are therefore classified as type 3. Defining the type of lesion is how we determine how to treat resorption. Picture of a dental probe on the left side of this instrument and explorer tip on the right side. This is one type of instrument utilized in the diagnosis of tooth resorption. 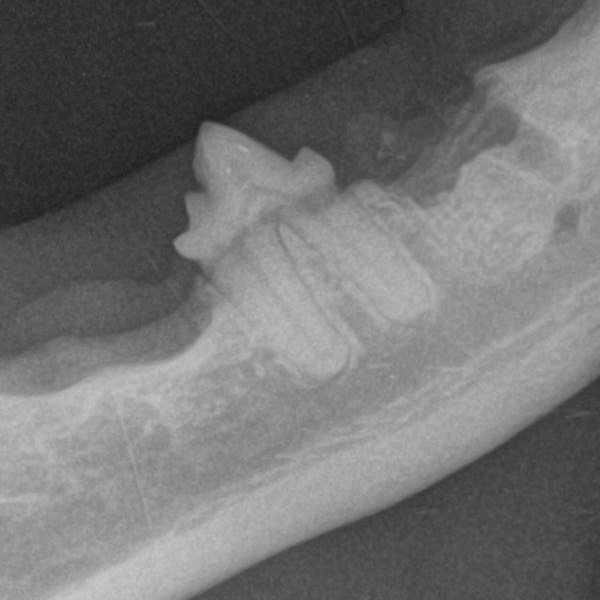 How do I prevent resorption from happening in my cat or dog? Because we do not know what causes tooth resorption, prevention is difficult. For this reason, if a patient has been diagnosed with resorption in the past, we recommend annual examinations, cleanings, and dental radiographs. 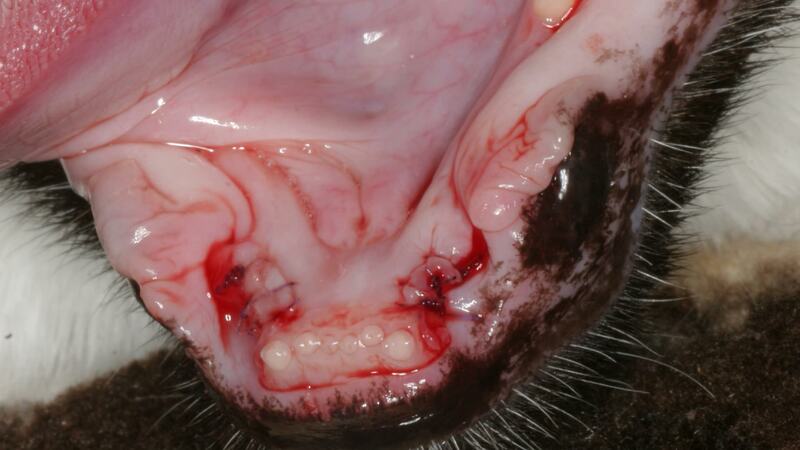 A patient with affected teeth will often develop more lesions through time, so these annual examinations are vital for cats with known tooth resorption. 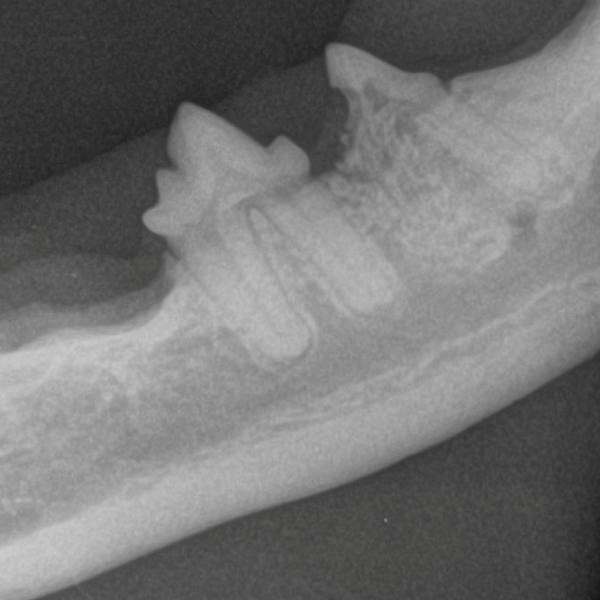 Additionally, the fact that tooth resorption is so common in feline patients indicates that full-mouth dental radiographs should be part of every dental procedure in cats. As noted above, dental radiographs are vital in the diagnosis and treatment of tooth resorption. Even though resorption is difficult to prevent, brushing is always a good idea to prevent periodontal disease and to keep an eye out for sore spots in your cat or dog’s mouth! Treatment of tooth resorption involves extraction of all affected dentition. We know that our domestic cats can function very normally with few to no teeth, so it is important that we not avoid treating this painful condition for fear of tooth loss. If we let the process continue, the tooth will eventually be lost regardless, it will just be a very long and painful process. In the past, restoration of these lesions with materials like glass ionomer has been attempted, but this is unsuccessful because the lesions progress regardless of the restoration. The type of extraction will be determined by the type of lesion that was diagnosed on x-ray (as discussed above). Type 1 lesions require full extraction of all crown and root substance. Type 2 lesions involve removal of just the portion of crown and root that remain. This procedure is often called a crown amputation because of the loss of the root substance and subsequent inability to remove an entire intact root. The roots in type 3 lesions are treated individually by either extraction or crown amputation based on the presence or absence of root substance. A picture of an x-ray following the removal of a mandibular 3rd premolar tooth that was affected by resorption (see previous pictures). The mesial root was extracted and the distal was amputated/all visible root material was removed. 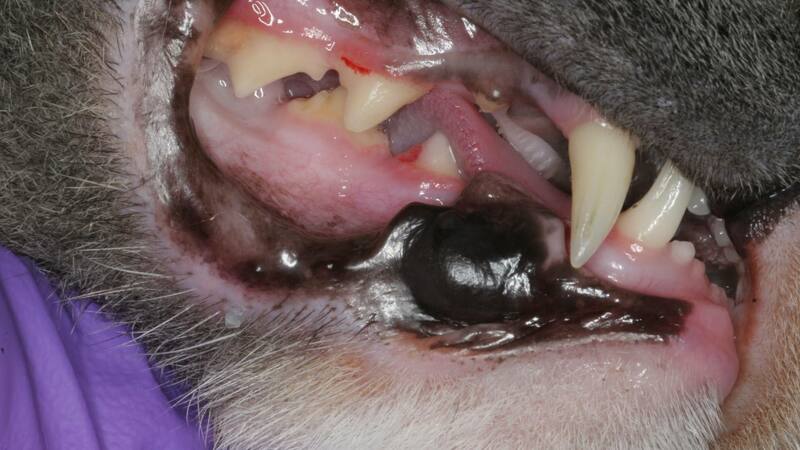 Here is a picture a resorptive lesions on the distal (back) aspect of these two mandibular (lower) canines in a cat. In the attached x-ray, it can be seen that there is no root substance visible anymore (no visible root canal or periodontal ligament, or black line around the tooth). For that reason, treatment involves crown and all visible root substance. To do this, a gingival flap is made and a bur on a high-speed handpiece is used to remove bone. The site is then closed with absorbable sutures. Here is the post-operative picture of the cat with the resorptive lesions as seen above.